Do members of communes, ecovillages, and those who listen to the Beatles have the "hippie gene?" If you are a peaceful person, you may have it. If you have it then you may want to acknowledge it and use it. Everyday we are actualizing global culture as we break taboos, overcome our fears of authority, and modify our hereditary traditions. In some cases traditional norms die and new cultures are born; sometimes these new actualized groups we develop are radically different (diverse) from what we already know, so much so that they are often resented or rejected by some of the more established social groups to such a degree that discrimination emerges as we know from studying the Hippie culture that became established in the US during the 60's and resulted in a generation of people. As human beings with rights inalienable from birth, God given, or granted to us by our governments or by the United Nations we have all voluntarily decided to respect most of these cultures, traditions, alternative lifestyles, and counter-cultures in the name of peace, equality and brotherly love. Acceptance or understanding the ideal social condition (accepted world view) I have been proposing, involves everything eco (green) in technology, tradition, nature, community, spiritualism, and sustainability within a real world practical earth based application which I am calling Ekōbius﻿ fortunately has not received negative attention nor have our ideals been rejected in anyway by our peers, new indigenous neighbors or the government. In fact they have all accepted us, our ideals and have even granted us with special exceptions in the case of the Venezuelan government under the constitution to manifest and develop our own special lifestyle. The hippie movement of the 60's and 70's spread globally since it was recognized and through music, film, art and philosophy, now independently is known as a people (culture)in favor of peace, love, and mutual respect for all of humanity. Some older hippies have become so caught up in the cultural ideals that they idyllically developed a status quo of what it means to be a "real hippie," which is in my opinion completely counter the hippie culture of simplicity, letting your hair down, and freedom; but from a historical perspective certainly has its own value and makes us romantically remember Haight-Ashbury and Woodstock and makes younger hippies today wish we all could have been there. But really being a hippie would be way too much for me if I had to take a test and get an id card to qualify, the whole process would be so anti-hippie. 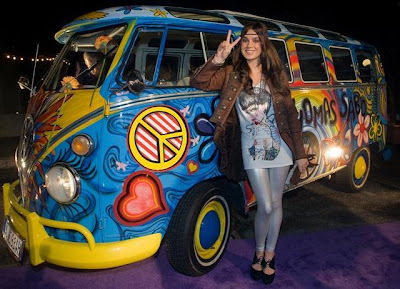 Relative to style I am a pretty 'hard-core lava lamp and veedub microbus hippie;' the last vehicle I owned was a school bus conversion packed up with camping gear and chattels I traded in flea markets in Miami when I was there last in 2004. This lifestyle for me was my corporate parallel existence that I adapted to exist in the mainstream, where I would park my bus, change into a suit, check into a hotel and work as a goodwill ambassador and fundraiser collecting surplus for recycling in Venezuela, after work I could take off the suit and take a cab and go back to the vagabond life which I really enjoy for its peaceful way. Today we see many super hybrid 'new' hippie type subcultures that manifest sporadically with the core dynamics of the (hippie culture) as the common denominator within over a dozen primary hippie sub-cultures and exist healthily independently all over the globe. Popular political ideologies and values of the 60s and 70s have spawned new movements that are now grandfathering in yet more new movements evolving from the original hippies involving peace, animal rights, human rights, ecology, and cultural identity as some of the values passing through the new generations in their blood. It all makes me wonder as to whether or not that there may really be a "hippie gene." It certainly deserves some investigation considering that a real generation fully evolved (gene/generation)? Because of the diversity of all the hippy spawn (ideas) and hybridization of incorporating what hippies found to be "right in life" the resulting modern base culture has been silently idolized and envied as well as rejected and ostracized to their own distinct advantage of living in a peaceful coexistence within nearly any society. Here is Venezuela there are at least 4 identified hippy subcultures and in the US and around the world we see others like the Rainbow Family that draw a diverse new myriad form generations under development. I am not sure where we fall exactly in this spectrum because we are very similar to many others but simultaneously our formation is very unique because it's based on the inclusion of practical essential compatible elements of our environment, practical needs, and the mixing of subcultures not previously combined even though most of them emerged from the same hippy generation. The most similar types of culture to ours are forming or already operating successful cooperatives or communities and because of their individuality and remoteness very poorly networked and therefore are somewhat isolated. Forming our initiative has been the greatest challenge of my life as the principle coordinator, especially trying to network (a new concept Ekobius) with so many that are already busy trying to form their own communities, it's been like trying to sell a car to an automobile manufacturer. I am confident our project will eventually take off because Ekobius offers so much to those who become involved, is much different than all the others we have seen because it provides the additional optional opportunity to work in a cooperative as well as live in a communal ecovillage, and it is different because it welcomes particular visitors from mainstream society other opportunities with ecotourism and cultural experiences. The difficult part is that we are located in South America at the last great frontier on earth, the Amazon. Our project became widely accepted locally because it offers an opportunity to enrich the lives of other neighbor communities by acting as a regional cultural and technological incubator of best practices and methods in sustainable living, and is acknowledged by the government as its own community. Many of these similar communities and social groups to ours can only be found as listings in paper directories like the IC Directory of Intentional Communities (which lists all alternative communities from religious cults to ecovillages) while others are online with classifieds on craigslist and yet others are active in social networks, then there are all the splinter groups of people that share our ideals in backpacking clubs, prepper networks, and university biological science departments. Meanwhile as we try to define ourselves, find a particular social group we fit into, and create our identity we will have to list ourselves in all those places we find that others use to promote their community projects to attract the right residents and project volunteers. So far we suspect that all of our visitors and those interested have the hippie gene or at least they appear to have it.